A busy week ahead for everyone as we prepare for the Michael J Murphy, Winter School which runs from Thursday evening through to Saturday. Around 250 pupils from 5 schools: St. Joseph’s Meigh, St. Oliver Plunkett’s Forkhill, Dromintee Primary School, Scoil Eoin Pol, Loch an Iuir, and St. Mary’s have collaborated to take part in a programme of School’s events. 1. Pupils from across the schools, have produced I Movies with parents and grandparents to tell stories from around the foot of Slieve Gullion and Loch an Iuir. 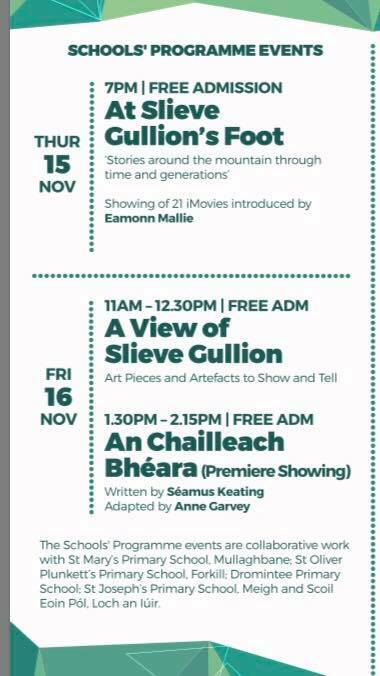 These will be shown on Thursday evening, starting at 7 pm in Ti Chulainn, with Eamon Mallie compering the event. 2. P5 pupils in St. Mary’ s have worked with local artist Sharon Carragher and produced ceramic art work representing the theme, “My view of the Mountain”. This fabulous work, along with work produced by the other participating schools will be on display over the weekend. P5 pupils from the schools will have the opportunity to attend the Art Exhibition and view their finished work, on Friday Morning. 3. P6 pupils in each school have dramatised a scene from a play set on Slieve Gullion, (orginally written by Mr Seamus Keating, Past Principal of St. Mary’s), it has been adapted by Mrs Anne Garvey who has worked with the pupils over a 6 week period. Each school has had their section videoed and these have been edited to form a complete adaption of the play. This will be shown on Friday afternoon and all P 6 pupils will attend the showing. We will have another showing at a later date for anyone interested in viewing this amazing collaborative dramatisation. All events over the weekend are listed in the Winter School brochure, below see the School’s Programme and timings.